What is to come for Ayegardening in 2015? 2015 is going to be another memorable year for Ayegardening- for two reasons. Our fourth child- a girl- is due this week and we have expanded our business and landscaping services by taking on a skilled landscape manager with 20 years experience to work to manage the team. We have been able to introduce new services this year- driveways, brick walling and white rendered walls to name a few. Taking on a landscape manager will enable Aye to spend more time on quotes and site visits while giving Susan a well needed rest from running the admin side of the business. This year we introduced our new Ayegardening website which has proved really successful. One of the things we wanted to do with the new website was to provide more information for customers- we have started to build up useful resources for customers such as: understanding the range of materials available like decorative aggregates and guides such as measuring the garden for artificial grass. With the move towards more landscaping we have also introduced our Aye Landscape Construction website which will showcase the hard landscaping side of our business. Those that know us, know that we love before and after photos so we wanted to share some of our work from this year to show you the kind of projects that we undertake and how we can transform gardens. Brief: To create a new block paved driveway in beige tones with a red border. Client also wanted a small fenced off area with artificial grass at the top of the drive so that their dog could be contained if the client was getting shopping in or if it was a warm day and they wanted to keep the front door open to let a breeze through. Testimonial from client: From the first meeting, nothing was too much trouble. Friendly and professional team. Work was carried out quickly and within the estimated time to complete. I made numerous changes along the way and I was met with total understanding. Would highly recommend AYE Gardening services. Brief: As part of a garden renovation this client wanted to sort out the pond area first, by completely clearing the area, filling it in and turfing. Testimonial from client: Excellent service, organised and efficient from start to finish. The work carried out was exactly as we wanted it. The team were very hard working, friendly and listened to what we wanted done. The price was also well within budget. I would definitely recommend and would definitely use again. Brief: Clear ivy carefully from tiled wall of house. This was a client whom we had built composite decking for previously in their back garden. Testimonial from client: We had some ivy removed from house that had badly overgrown. Aye and his team were very careful as half of the house is tiled and did a very good job. We had some decking installed by them last year and again they were extremely good. 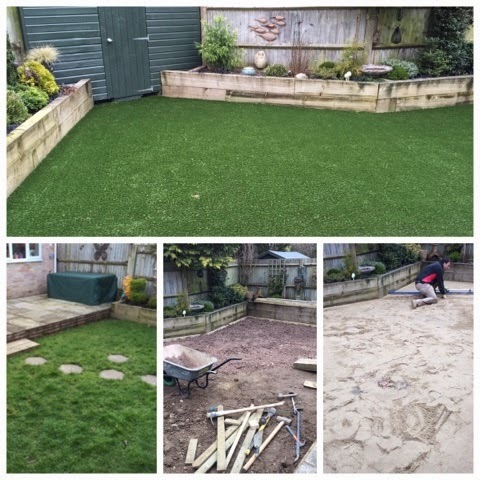 Brief: Top quality artificial grass installation. Testimonial from client: We are delighted with finish, the workmanship and the effort put in to please us.